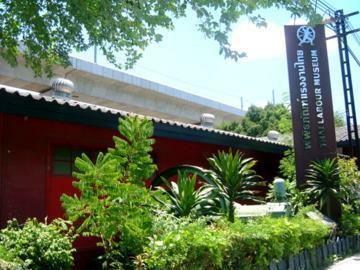 The Thai Labour Museum is housed in a modest single story red building by the railway line near the Makkasan railway station. The building used to be the railway police station, then the railway labour union office, before being converted to a museum on 17 October 1993. 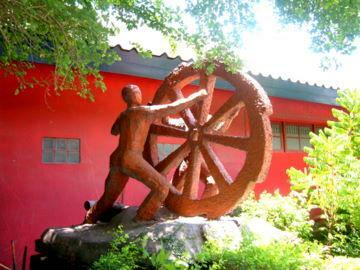 The monument outside the museum signifying the "Dignity of Labour" shows a man and a woman pushing a huge wheel, the wheel of history. The museum captures the 300-year history of the Thai labour movement from the days of slavery to the present, tracing the evolution of the Thai labour. The journey in the Thai Labour Museum starts with the period of slavery. Since the 1700s slaves and commoners or Phrai worked without wages. The Phrai were tattooed with their names of the area of abode and their masters. The Bowing Treaty in 1855 in the reign of King Rama IV opened up trade and pressure for reform. Increased labour demand was met by the influx of Chinese immigrants. This was the advent of paid labour though conditions were abysmal. In 1873, King Chulalongkorn or King Rama V abolished slavery, a watershed in the history of Thai labour fittingly recorded in this museum. All men were free to seek employment for a fair wage. The early 1920s had no clear government policy on labour. Labour had no right of organization. Industrial disputes and strikes were frequent. Intellectuals, the pioneers of the labour movement, tried to raise awareness to this growing problem. The 1932 coup brought hopes of improvement. The Thai Tram Workers Association, the first labour union was formed. A nationalist economic policy required Thai ownership of companies, registration of unemployed and recognition of workers' rights. The Japanese occupation in World War II put a halt to things, causing unemployment, inflation and severe hardships. Many workers joined the underground resistance movement. Thai labour's setback continued during the Cold War. Military dictators, who were staunchly anti-communist and anti-labour, clamped down on labour as workers' rights and unions were considered unfavourable to investment. Widespread discontent forged an alliance of workers, farmers and students that boiled over in 1973. The video in the Thai Labour Museum gives a detailed account of the events leading up to the bloodbath on 14 October 1973. Other problems were that of abuse of child and women labour and gross neglect of workers' safety. In 1993 188 workers, mostly women, perished when a fire burnt down the Kader Doll Factory. The 1997 economic crisis was another bitter pill. The last stop in the Thai Labour Museum is a fitting finale as it embodies the spirit of the politically disenchanted, the exploited and neglected. The labour movement took their plight to the people through music. Hardships and toil are expressed through songs with poignant images of broken dolls and tearful children mourning the loss of their mothers in the Kader Doll Factory fire. Issues still facing Thai labour today are a fair minimum daily wage, the privatization of state enterprises and workers' safety. Will a new page be written in Thai labour history for inclusion in the Thai Labour Museum? The museum is in a single-story red building near the Makkasan railway station near the busy Pratunam junction. From the Pratunam junction proceed northwards along Ratchaprarob Road to the level crossing at the Makkasan junction. Turn right at the Makkasan junction and travel along Nikhom Makkasan Road parallel to the railway line till you pass the Eastin Hotel on the right and the Makkasan Railway Station on your left. Continue on past the level crossing and the entrance to the Bangkok Palace Hotel on your right. Bus services are infrequent along Nikhom Makkasan Road so it’s faster to walk in, if you’re not driving. The distance from the Makkasan junction to the museum is about 750m. Group tours are welcomed. Please contact the Thai Labour Museum in advance for a guide. 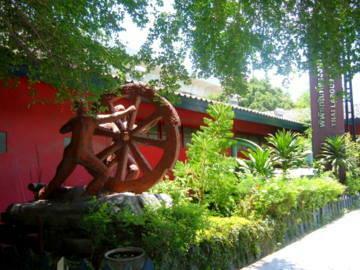 The museum is opened everyday from 10:00 am – 04:30 pm except on Mondays and Tuesdays. Admission is free. Donations to support the maintenance of the museum are welcomed.